Everyone's circumstances are different and everyone deals with fear in their own way. A pill to erase fear (or stress) would be nice, but every new pill has so many side effects...I have faced fears and thought others through to the point I realized I was afraid for no reason. Win! I have both faced my fear and stepped back from my fear. Both have worked in cases, both have not worked. But I am still here and that is what matters! Looks like we each went with a similar quote. Yes and it is so true. Love me some "Tears for Fears"! Just recently heard about how they got to their band name. It was inspired by primal therapy, developed by the American psychologist Arthur Janov, so they knew a thing about fears as it seems. That is an interesting fact I didn't know. I know this song isn't really on topic, but one line that says "these are the things I can do without" spoke to me about fears, and the group name ties in as well. Just recently, I heard a speaker that was talking about Roosevelt's quote and pointed out that often fear is real and justified about a number of things. I think your point that there are so many variables of why we are fearful and what we are fearful of depends on our capacity to handle it or be consumed by it. 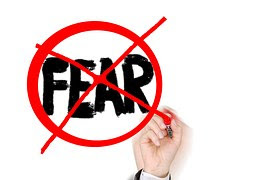 I agree that fear is often justified, but there are times when we can get carried away with the media coverage (we know they always tell the truth) and get overwhelmed and frightened for no reason. I think that has happened a lot lately.